This surgery involves removing fibroids from the wall of the uterus (womb). An open surgery requires an incision large enough to remove the fibroid. Fibroids are noncancerous tumors in the muscle of the uterus. The symptoms caused by fibroids are often successfully controlled with this procedure. This may include a return to a normal menstrual cycle and the ability to become pregnant. Whether you should have hormone treatment for 2-4 months before the procedure—This treatment shrinks fibroids. It makes them small and reduces the risk of excess blood loss during the procedure. If cancer is found in the uterus—One option is to remove the uterus during the myomectomy. Arrange for a ride home from the hospital. Also, arrange for help at home. Do not eat or drink for at least 8 hours before the procedure. General anesthesia is used most often. It will block any pain and keep you asleep through the surgery. It is given through an IV in your hand or arm. This may also include a mask or intubation. An incision will be made in the lower abdomen. Muscles will be separated, and tissue will be cut to expose the uterus. Next, the fibroids will be removed. In some cases, you will be given a medication to reduce the amount of blood loss. After removing the fibroids, each layer of tissue in the uterus will be stitched. Lastly, the stitches will be used to close the incision area. You will have abdominal pain and discomfort for 7-10 days. You will be given medication to help control the pain. Wear sanitary pads or napkins to absorb blood. The first menstruation after the procedure may be heavier than normal. Be sure to follow your doctor's instructions. 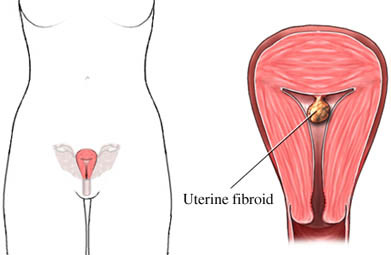 Uterine fibroid symptoms, diagnosis, and treatment. Society of Cardiovascular and Interventional Radiology website. Available at: http://www.sirweb.org/patients/uterine-fibroids/. Accessed December 11, 2017. 6/2/2011 DynaMed Plus Systematic Literature Surveillance http://www.dynamed.com/topics/dmp~AN~T909182/Prevention-of-hospital-acquired-pneumonia : Mills E, Eyawo O, et al. Smoking cessation reduces postoperative complications: a systematic review and meta-analysis. Am J Med. 2011;124(2):144-154.e8.